Just who IS this Vokes person and why should we read his Blog? Well...I think i can answer that 1st question,but the 2nd is ultimately up to you,dear reader. I'll try not to ramble-much-or rant...no...odds are I will rant from time to time-lol-it's in my nature to pull out the old soapbox from under the bed and to share my opinions on certain subjects-Heck,that's what these blogs are for,right? As days pass, I'll attempt to give you some background on me and my work-I say those two together because much of what I am is my work-not to say it dominates my life,but it's a goodly part of what makes me tick. Let's start with a little background,shall we? How about we introduce Neil Vokes,comic book artist? 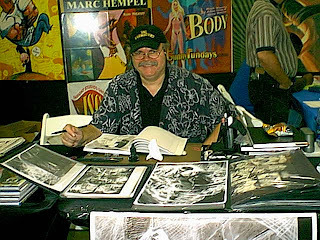 I've been telling stories in comic books professionally now for about 24 years, thanks to my wife,Siri, convincing me to give the comics biz a try back when i lost my "real" job-OK-I didn't LOSE it-it was taken from me,but "lose" just sounds kinder. I started at a new company in Norristown,Pa,Comico Comics in November of 1983 (i still have a copy of the 1st check i earned,with a photo of the publisher,Phil Lasorda handing it to me ;o), with friend and inking partner Rich Rankin who has long since left the business to hang onto his sanity best he can (smart move,pal ;o). We learned "on the job" at the little company that could and made several life long friends-it was one of the most precious times in my entire life. Comico hired me to pencil the Japanese cartoon based Robotech Masters for my first regular gig. I was very lucky in that it was a great opportunity for a comic virgin like myself and I was paired with a talented writer named Mike Baron,creator of the legendary NEXUS.After drawing the Japanime styled book for awhile,Rich and I felt we could do our own project-ah the confidence of youth-The independent B & W comics market burst forth with a little book called TEENAGE MUTANT NINJA TURTLES-in no time,amateurs and pros alike were doing martial arts themed indie comics-this exciting time eventually led to Rich and myself co-creating EAGLE, a martial arts/sci fi/supernatural adventure series which we self-published for several years through Crystal Comics (our own label) until the b& w comics boom, fizzled in the twilight days of the 80s. I then dove back into the work for hire pool again. Well...I've left quite a few out due to space and humility...well, OK, just space. I have several more projects coming up in the coming days and years. First I’ll be continuing my successful partnership with Bob on another horror book called THE VOICE (based on another of his screenplays) and after that an homage of sorts to the famous British company Hammer Films that Bob,Adrian Salmon (THE FACELESS) and I will be doing sometime in '08- then i hope to finally work with hot young writer Miles Gunter (ZOMBEE) on an adventure/fantasy/sci fi epic-I am also planning on re teaming with ol buddy Mike Oeming on a couple projects- It is also my sincere intention to return to my beloved EAGLE. It has been an honor and a privilege and a pure, unbridled joy to be a storyteller/artist all these years. I hope that I've been able to share a little of that joy with those of you who have followed my career even casually.